The player also admitted he deserved to be sent off for his challenge on Santi Cazorla yesterday. 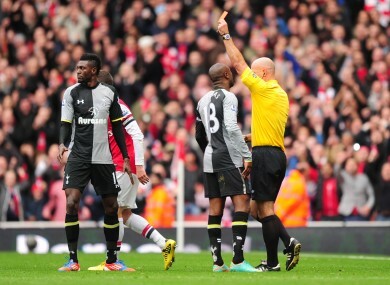 Tottenham Hotspur's Emmanuel Adebayor (l) is shown a straight red for a dangerous tackle on Arsenal's Santi Cazorla. TOTTENHAM HOTSPUR STRIKER Emmanuel Adebayor has apologised for being sent off in his side’s 5-2 thrashing by Arsenal in the north London derby. Having given Spurs an early lead at the Emirates Stadium on Saturday, the former Arsenal striker was shown a straight red card in the 18th minute following a wild, two-footed challenge on Santi Cazorla. Arsenal fully exploited their numerical advantage, quickly drawing level through Per Mertesacker and then racing into a 4-1 lead with goals from Lukas Podolski, Olivier Giroud and Cazorla. Gareth Bale replied for the visitors before Arsenal winger Theo Walcott completed the rout in injury time. “I completely understand my sending off changed the entire outcome of the game and I whole-heartedly apologise to my team-mates, the manager and all the Tottenham fans for letting them down,” Adebayor told British newspaper The Sun. “But I must stress that my challenge was not malicious in any way whatsoever. “I was genuinely trying to win the ball and probably stretched my foot out a bit too far in the heat of the moment. “Nobody could have felt more devastated than me as I walked off the pitch. “I so much wanted to help Tottenham win and thought for a moment that I’d actually set that win up when I scored, but football changes so quickly. Tottenham coach Andre Villas-Boas admitted that referee Howard Webb made “the right decision” to dismiss Adebayor and said that he would not be punishing the Togolese forward. Email “'Devastated' Adebayor says sorry for derby red”. Feedback on “'Devastated' Adebayor says sorry for derby red”.